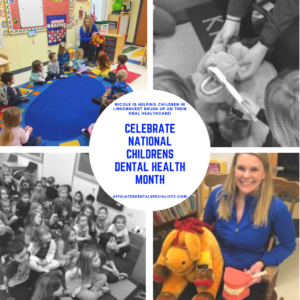 February is National Children’s Health Month, and the staff at Affiliated Dental Specialists love to promote good oral health care to our patients and the community. 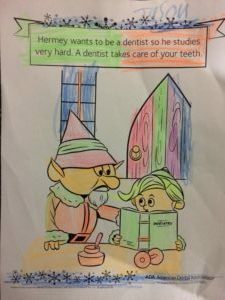 We reach out to various schools and preschool programs to talk to students about how to care for their teeth and have the Smile if a Lifetime! Be sure to follow us on Instagram and like us on our Facebook Page for some of the visits with children in our community, and keep your eyes open for pictures from Dr. Orbon’s mission trip! The latest Contest at Affiliated Dental Specialists is the Fish Club Art Contest! Now is the time for you to tap into your creativity and enter your artwork to win a $25 Regal Cinema card and bragging rights! Good luck and visit The Contest Page for all the details. 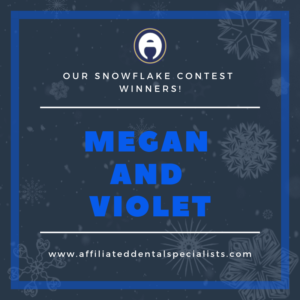 Congratulations to Megan and Violet on winning the Snowflake Contest! Thank you to all the patients who put their counting skills to the test! Your $25 Regal Cinema Gift Cards will be at the office to pick up at your convenience. Allergies and sensitivities are on the minds of many patients. The doctors and staff at Affiliated Dental Specialists take the concerns of patients and families very seriously. 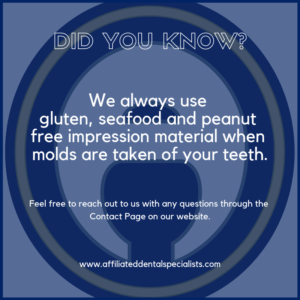 Our patients can rest assure that every time an impression is taken at our offices, we only use impression material that is free of gluten, seafood and peanut products. Depending on the day, there are news segments or posts on social media announcing the latest benefits or dangers of drinking coffee. Plain, black coffee without any sugar, syrup, whipped cream or other add-ons is a healthy beverage that can be enjoyed hot or cold. Coffee, however, may stain your teeth. 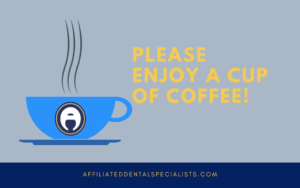 When you decide to enjoy a cup of coffee, in our office or somewhere else, be sure to drink it plain, drink some water afterwards, and keep brushing twice a day and flossing. Enjoy that cup of joe! February is National Children’s Dental Health Month (NCDHM), and it’s a wonderful time to build on your family’s oral healthcare routine! This year’s NCDHM campaign slogan is “Brush and clean in between to build a healthy smile,” and Dr. Orbon and Dr. Maddox couldn’t agree more. 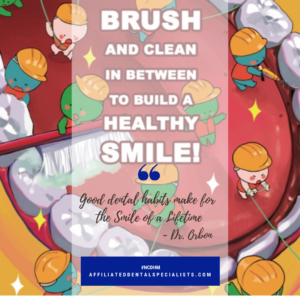 The doctors and staff at Affiliated Dental Specialists promote the benefits of good oral health to children, their caregivers, teachers and many others during the entire month of February. 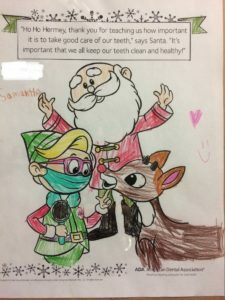 Any time is a good time to ask the doctors and staff at Affiliated to go over brushing techniques with your child. 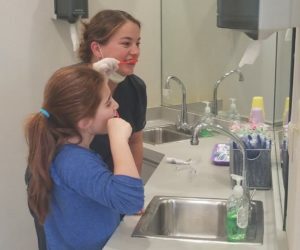 Recently, Dr. Port’s orthodontic assistant took the time to give one of his patients a brushing tutorial. 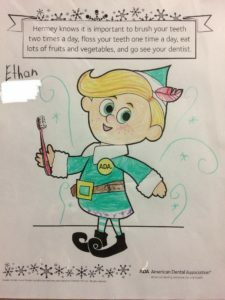 So, let’s make this the start of great oral healthcare habits for your child and family! Feeling creative? 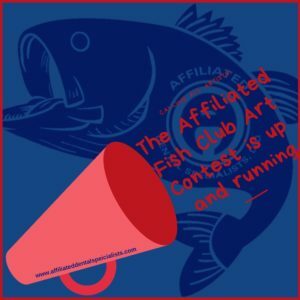 The Affiliated Fish Club Art Contest is in full swing. 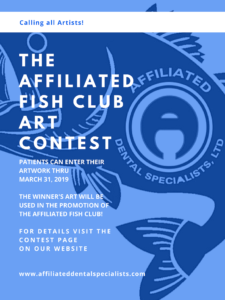 All Affiliated patients and their families are invited to enter the contest for a chance to win a prize and to have their artwork be used in the promotion of the Affiliated Fish Club 2019! Check out The Contest Page for all the details. Good luck! Toys for Tots 2018 is a Wrap! The Doctors, Staff and Patients of Affiliated Dental Specialists show up in full force for Toys for Tots by donating toys to children in need. Thank you to everyone for donating to Toys for Tots as we wrap up 2018! We wish you the happiest of holidays! Jason Joins the Coloring Club! 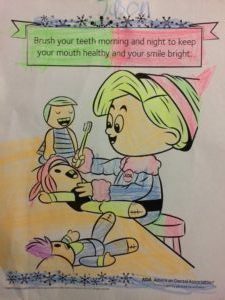 Jason took the time to color two entries for the Affiliated Coloring Club, during his sister’s appointment. Hermey has never looked so good! Ethan and Samantha decided to create their entries for the Coloring Club while their brother Gavin had his appointment with Dr. Port. Be sure to like us on our Facebook Page and follow us on Twitter and our Instram account. By following Affiliated’s social media, you get to see all of our Affiliated Coloring Club members with #coloringclub. Email Pat with your Instagram username and she will be sure to tag you when your entry is posted.